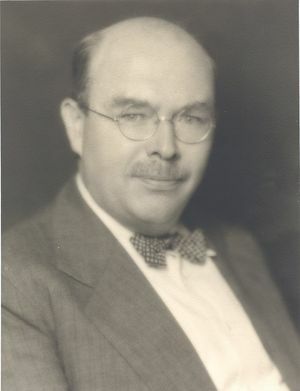 Lawrence C. F. Horle, IRE President, 1940, was an expert radio aide for the U.S. Navy during World War I, and his work centered around the standardization of terminology and ratings. Lawrence C. F. Horle was born on 27 May 1892 in Newark, NJ. He received his degree in mechanical engineering from the Stevens Institute of Technology in 1914, where he stayed on, as an instructor until 1916. During World War I he served as an expert radio aid for the Navy. His subsequent career included the following positions: chief engineer of the de Forest Radio Telephone and Telegraph Company, New York; consultant, Department of Commerce Radio Laboratory, Bureau of Standards, Washington; chief engineer, Federal Telephone and Telegraph Company, New York; and vice-president, Federal Telephone Manufacturing Company, Buffalo. His most important contributions to radio were in the field of standardization of terminology and ratings. Horle was president of the IRE in 1940. In addition to his long-standing affiliation with the IRE, Horle was chief engineer of the Radio and Television Manufacturers' Association. In 1948 he received the IRE Medal of Honor "For his contributions to the radio industry in standardization work, both in peace and war, particularly in the field of electron tubes, and for his guidance of a multiplicity of technical committees into effective action." Horle died on 29 October 1950, at the St. Barnabas Hospital in Newark, NJ. This page was last edited on 3 February 2016, at 15:43.